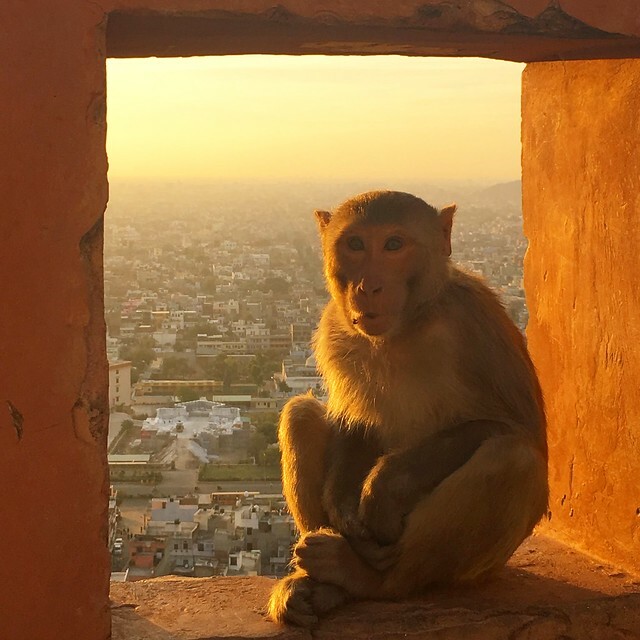 Jaipur- city of monkeys, palaces and Bollywood. 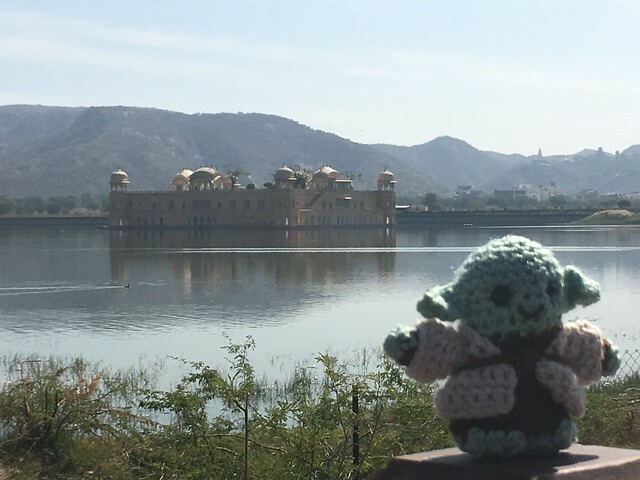 We arrived in Jaipur, the last of the golden triangle, in the early morning. The train station seemed a maze of tracks and blocked off stairs, so much so that we lost a member of our group and Jai (our CEO) had to go find her. Under the care of his ‘fixers’ we boarded the usual tuk-tuk (although these were a slightly wider variety that had room for luggage at the back too), and drove the shortish distance to the hotel. The Bissau Palace was a former palace once long ago, now a private residence come hotel. It looked impressive and had some fantastic rooms. Ours had some ornate arch ways and the restaurant had a collection of local taxidermy (leopards, tigers and bears) as well as old photographs, trinkets and books. We got our rooms, quickly freshened up and headed out. The first stop was the Wind Palace for a quick photo opportunity. Called Hawa Mahal is so named because it was essentially a high screen wall built so the women of the royal household could observe street festivals while unseen from the outside. Built in 1799 by Maharaja Sawai Pratap Singh. Architecturally, it was impressive and slightly unusual to look at, mixed with the local street vendors and shops around it. The second stop was the ever more impressive and main attraction of Jaipur- The Amber Fort. We got the traditional shot of it reflecting in the lake below and ventured up the steep slopes. Worn stones like marble made the climb tricky, as did dodging the many elephants, hauling people up on their backs. While they looked impressive and pretty painted, with ornate decorations and covered in red cloth, they were clearly poorly treated. We decided not to support the elephant keepers and walked up ourselves. The Amber Fort was built in 1592 by Raja Man Singh. With an impressive design of 4 court yards, each giving way to new sights and fascinations: gardens, mirrored rooms and impressive archways. A worker reinventing took us up to the highest level (for a tip) and we had impressive views looking down. Well worth the visit and mostly well maintained for the most part. Mike was keen to get down before the rest of the group and he sent up the drone for its first proper outing. We found a little outbuilding and sent it up quickly. It captured impressive shots of the Palace as you can see below. Next we stopped for another photo opportunity at the Water Palace. In the middle of a lake it was nothing more than a pretty picture. Knitted yoda had his photo taken too- more of his adventures here. That evening we before sunset, us and others from our tour group decided to head to the Monkey temple we had seen pictures of online. Our driver dropped us off on one side of the mountain while the other driver dropped the another group on the other side. We both saw different sights, there’s more impressive. Anyway we hiked up the hill and fed monkeys as we went with peanuts. Them taking them out of our hands and jumping on a couple of us. We had been warned they were dangerous but they seemed fine if treated with care. At the top we arrived at a temple to find it was the sun temple. The kind lady told us that the whole mountain area is known as monkey temple because there are a lot of temples and monkeys. So hope of seeing the others faded. We waited for sunset and the others managed to join us on the top of the hill. A few stunning shots of sunset and monkeys, Mike tried the drone again but got told off by the temple owner. We descended the hill and fed the monkeys the rest of our peanuts but by now they were more interested in the rotten fruit the locals had given them (mainly tomatoes). 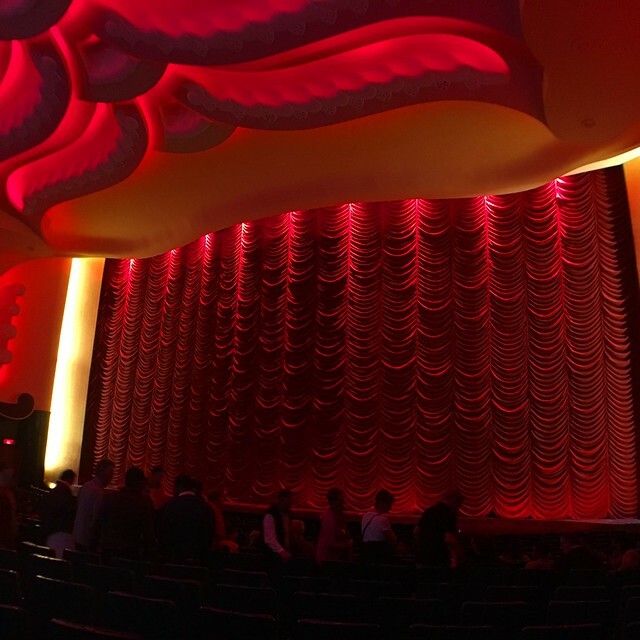 The theatre was beautiful, Art Deco style with one screen. Tickets were quite cheap at 150 rupees. We had an Indian combo of Pepsi, popcorn and samosas and settled into our seats, that surprisingly reclined slightly. The film wasn’t your typical Bollywood film. Not that I’m an expert having never seen one but that’s what Jai said. It was full of singing, dancing, explosions, fighting and revenge, as the main character, a blind man, took matters into his own hands-when his wife committed suicide after being raped twice. Shockingly the cinema was full of children and age ratings don’t seem to matter. If you get a chance to see Kabul, do- as it was well shot and worth a laugh. We departed for Udaipur on a late train having now completed the golden triangle- Delhi, Agra and Jaipur. ← Is the water in India safe to drink?